We can also offer large diameter structural bamboo (up to 4" dia and 40 ft long) for privacy and extremely useful timbers. 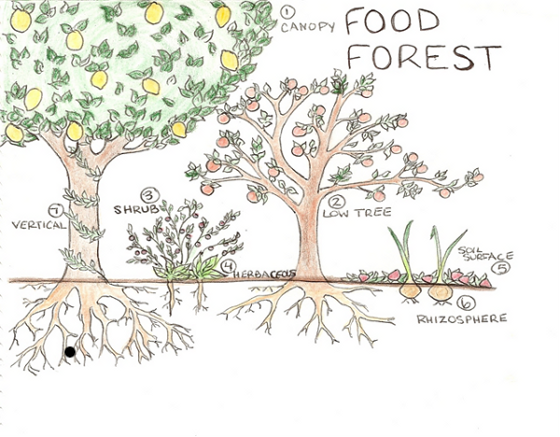 Our plantings will adhere to time proven permaculture principles and strive towards making your hedgerow a sustainable food forest for you and local wildlife. Our plantings include inoculation of beneficial fungi, including immune building turkey tails. We are now offering planting and designing services! Now is the time to plan your spring planting. Please email travis@greenconversion.net for more information. The benefits of hedgerows are amazing. I don't understand why every farm or homestead does not have some. In other countries, especially the UK they are used extensively. Some of the benefits are as follows. Hedgerows can perform several distinct functions. Depending on the plants selected, they can provide wildlife habitat, dust control, wind breaks, biofiltration, pest control, crop pollination, and natural beauty. Native plants make effective hedgerows. The natives bloom and set seed later than weedy invasive plants. The timing of their blooming and seeding is just right for many beneficial pollinators and too late for many pests. Hedgerows can help control insect pests. UC studies have shown that hedgerows have 90% fewer crop pests and 60% more beneficial parasitoid wasps (tiny, non-stinging wasps that prey on stinkbugs, aphids, scale, and many other harmful pests) than conventionally managed edges. Croplands adjacent to hedgerows have 10% more parasitoid wasps than conventionally-edged fields. Hedgerows support insectivorous birds that eat the larvae of pest moth. Populations of potentially harmful animals (such as field mice and gophers) are present in equal or lesser numbers in hedgerows than in conventionally-managed edges. Populations of predatory animals (such as raptors) that prey on potentially harmful animals are much higher in hedgerows. Hedgerows support native bees by providing undisturbed habitat, pollen, and nectar. Some species of native bees, such as Mason bees, are individually more effective at pollinating flowers than are honey bees. Hedgerows play a particularly important role in conserving and protecting farmland and woodland birds and mammals. Hedgerows help to prevent fields from losing soil, because they reduce the erosion caused by wind and they act as a barrier to water-borne run-off. 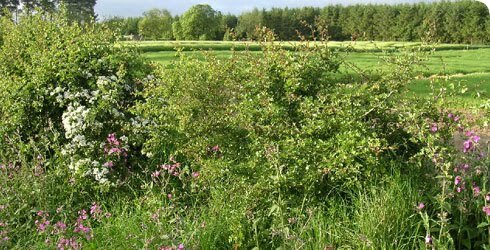 Hedgerows act as a barrier between polluting fertilizers, pesticides and sediment and watercourses. Hedgerows regulate water supply for crops. Hedgerows regulate the rate of flow of water within different areas. Hedgerows provide firewood – a renewable fuel – for people in the immediate area. Hedgerows in urban areas provide sustainable drainage, they reduce the amount of air pollution, and they provide a habitat for urban wildlife. They also make a huge improvement to the look and feel of built-up areas. Our planting will typically include a intermixed row of hardneck garlic and black currants, my favorite berry. In addition to the black currant's hardiness and excellent shrub producing qualities (and non spreading). Here are some of the other reasons.